For every farm kid who leaves for college or other life adventure, you’ll have a parent, grandparent, or uncle that imparts a piece of advice or two. Mine had a recurrent theme. “Remember your roots,” they said. As if the seed stickers on the back of my truck weren’t a strong enough reminder. I recalled this advice when a customer asked me about UF-Riata and why it has done so well in our area’s pastures and hayfields. There are many reasons why it has quickly become one of the favored seeds in our portfolio. 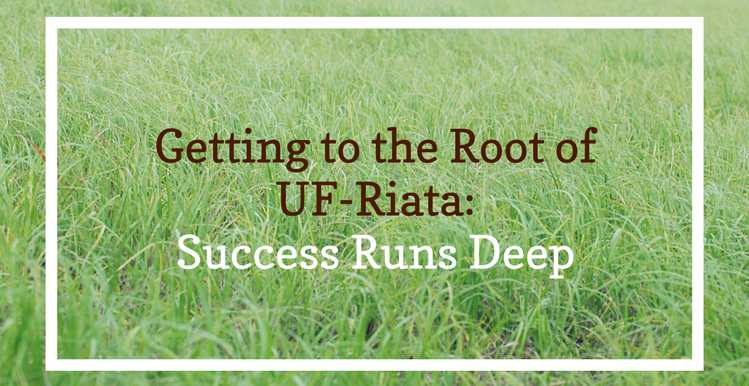 Success runs deep with UF-Riata plant, quite literally; its deep, sprawling root system is what has allowed it to be especially tolerant of low pH, lack of nutrients, and drought conditions. It simply makes the best of every environment. By sending roots deep into the soil, it creates a sod layer that keeps dirt in its place, protecting hillsides from the erosive qualities of wind and rain. It can draw moisture and nutrients where other pasture plants can’t, making it an effective grazing plant that matures and develops faster than most (usually in 25-day intervals). It starts growing sooner in the spring and goes later in the fall than other Bahiagrasses because its internal processes are both resilient and stubborn; it takes quite a bit to slow UF-Riata down. From agricultural communities to family farms to the seeds you choose on your pasture grounds, the best growth comes from strong roots. We’re proud to sponsor the development of a new Bahiagrass that stands the test of time, weather, and hooves. Mid-March marks the start of the optimum seeding season for UF-Riata. Have you experienced the difference it can make?